In his first adventure from Pro Se Productions, Gideon Synn battled curses and vampires. Now Author Teel James Glenn brings another tale of Synn, this time facing forces far more insidious and possibly more than even the occult adventurer can survive. The Second Synn: Bayou Sinistre A Gideon Synn Mystery is now available from Pro Se Productions in print and digital formats. A killer stalks the streets of New Orleans! Gideon Synn is in the Big Easy when an old friend is found murdered at the Duelling Oaks - run through by an antique sword. It is up to the Scarred Swashbuckler to find his way through a web of mystery and deceit to avenge his friend’s death. Yet questions haunt Synn as he winds his way through the city of strange wonders. Who is the mysterious woman from the cafe who seems to have invaded his dreams? Why do the paintings on the walls seem to tell the future? Will a trip to the backwoods of Bayou Sinistre and a meeting with Papa Ghoulle spell death for Gideon? Join new pulp author Teel James Glenn as he explores the voodoo smoke and jazz sounds of New Orleans in 1938. Action, Mystery. and Horror abound in The Second Synn: Bayou Sinistre A Gideon Synn Mystery. From Pro Se Productions. 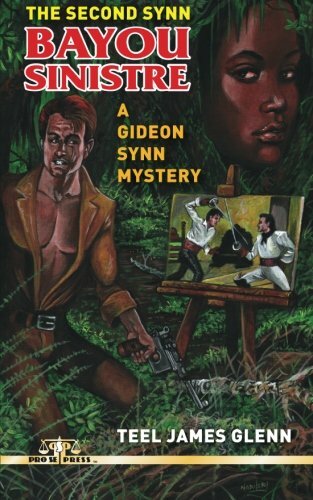 The second Gideon Synn digest novel features a haunting cover by Larry Nadolsky and print formatting and logo design by David Foster, is available on Amazon now at http://www.amazon.com/Second-Synn-Sinistre-Gideon-Mystery/dp/151914251X/ref=sr_1_1_twi_pap_2?ie=UTF8&qid=1447167703&sr=8-1&keywords=second+synn+bayou+sinistre and Pro Se’s own store at www.prose-press.com for 10.00. The Second Synn: Bayou Sinistre A Gideon Synn Mystery is also available as an Ebook, designed and formatted by Russ Anderson and available for only $2.99 for the Kindle at http://www.amazon.com/Second-Synn-Bayou-Sinistre-Gideon-ebook/dp/B016ZA3XU2/ref=tmm_kin_swatch_0?_encoding=UTF8&qid=1447167703&sr=8-1 and for most digital formats via Smashwords at https://www.smashwords.com/books/view/587074.